The young sergeant was rescued by the quick response of his commanding officer, Capt. Harry Truman. World War I was drawing to a close, but the tight bond among the fighting men of the “Wild Irish” Battery D would last for the rest of their lives, and years later Truman would become President of the United States. Among the veterans of this unit—they called themselves Dizzy D, or the Battery D Boys—this was a source of great pride. But it didn’t start so easily for Truman, who was as surprised as anyone when he was put in charge of these 194 men and 4 artillery guns. The soldiers were mostly Irish Catholics from Kansas City, and they had already gone through three other commanding officers. The Battery D Boys were considered bad news, prone to disrespecting their superiors, so the odds were not good that it would be any different for this mild-mannered Southern Baptist who showed up wearing little pince-nez glasses. On his first day, the troops derided him with a Bronx cheer and by nightfall a fight broke out which was so severe that several men ended up in the infirmary. Yet in time Truman earned their respect and he led them very capably into battle, including Sgt. Hardaway. All around them were such an array of colorful, assertive characters that this maybe explains both men’s post-war transformations. In the 1940s, working for Walter Lantz Productions, Hardaway more or less got to serve his country again. A lot of films there were made for the U.S. Navy, with additional films made for the Office of War Information. The animation studio was comprised of no more than forty people, a pretty lean operation especially considering how much they produced. The story department was just Milt Schaffer and Hardaway. Even before America’s entry into WWII, there was a noticeable theme of mobilizing for war that ran through the Lantz cartoons. Surely having a Battery D Boy as one-half of the story team had its influence. Bugs was a sturdy-looking man, older than most of his peers in animation, and the nickname had been with him for a long time. Bugs is what you called a tough guy back then, a variant of the gangster name Bugsy. If the name didn’t alert you, then the strong jaw might have done the trick. Shamus Culhane mentioned to me that he always got along fine with Bugs, even though they were on opposite ends of the political spectrum. They would argue politics over lunch, Culhane from a more liberal New York perspective, but Hardaway was a Kansas City gentleman and their debates were only pugnacious to make it lively. Everyone at the studio was eager for news of Allied battlefield victories, so on newsworthy days they kept the radio on to see how the war was going. With Bugs having served in France during the previous World War, he likely was the only person there who could provide some context as the American and British forces advanced toward Germany. Most everyone else at the studio was too young to have had that experience, so he told daring stories of the intense combat he had survived. The first cartoon that Hardaway wrote at Lantz was Recruiting Daze (1940), the first of many with patriotic or wartime themes. 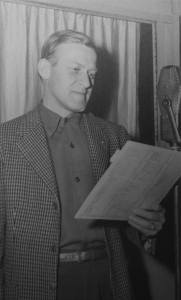 In fact, the studio released $21 a Day (Once a Month), a Swing Symphony about military service, exactly a week before the attack on Pearl Harbor in December 1941. 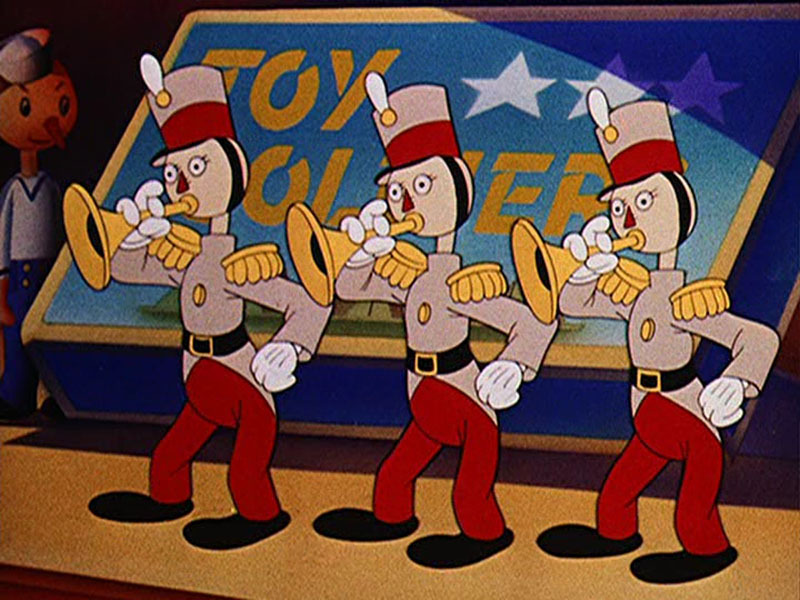 The lyrics, from a song by Felix Bernard and Raymond Klages, offer the perfect melting-pot perspective of the general draft: “You might have been a banker’s son/ You might have pushed a plow/ It makes no difference what you were/ You’re in the Army now.” In the cartoon, the oddball members of a Toyland army march joyously into formation. 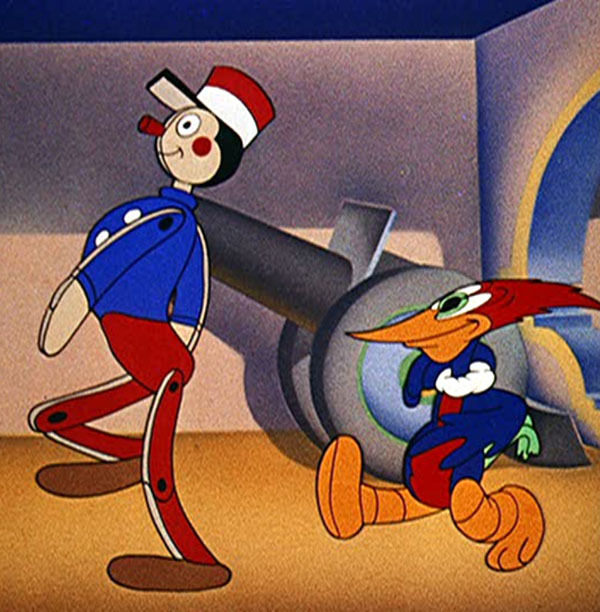 At that point in the song, near the end of the cartoon, Woody Woodpecker makes his sole appearance, dancing behind some toy soldiers whose legs rotate like wooden marionettes. Woody does exactly the same, bending his legs up from the knees at impossible angles like he’s a toy too. 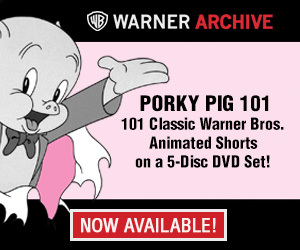 This whole short film is a crazy pastiche of gags from the mind of a World War I veteran who was an ol’ Battery D Boy. 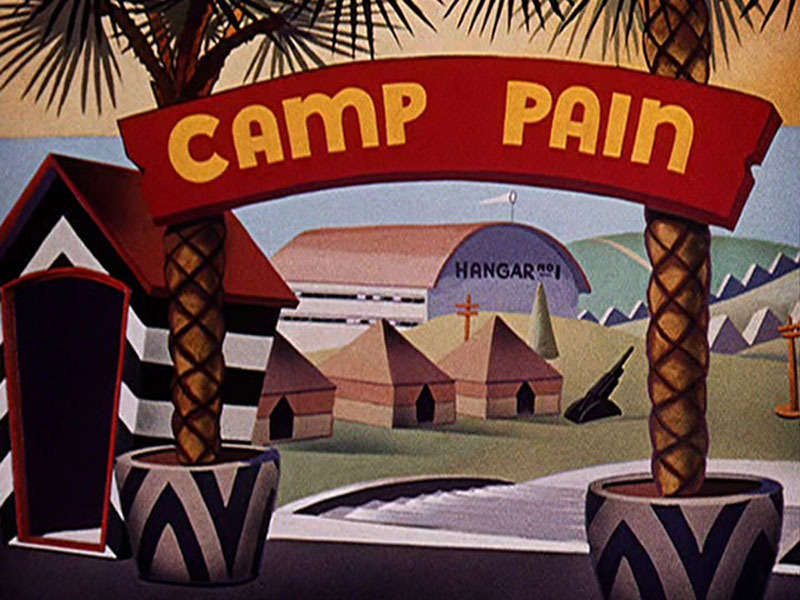 It was 1941, the nation was going to war, and the cartoons were apparently coming along. Andy Panda also made a appearance in $21 a Day Once a Month as a bugler calling the toyland troop in for payday. what a joy to start off my work day with such a film. One of my allllll time fave toons that revolves around a tune!! Great article Tom. Was unaware of the Truman connection. In any event, you can’t go wrong starting the day with a Swing Symphony. This is more than I ever knew about Ben Hardaway. Thanks so much for the information. What a fascinating era that was! Sure Was, Fred! Patriotic and cartoony both! Thanks for the bio on Ben “Bugs” Hardaway, and I like this cartoon a lot, but then I like all the SWING SYMPHONIES. On a slightly related note, I only found out recently that the voice of Buzz Buzzard in his earliest appearances was actually a voice in the old BANANA WACKIES cereal commercials. I remember liking the cereal, but I didn’t remember the voice appearing in that ad. 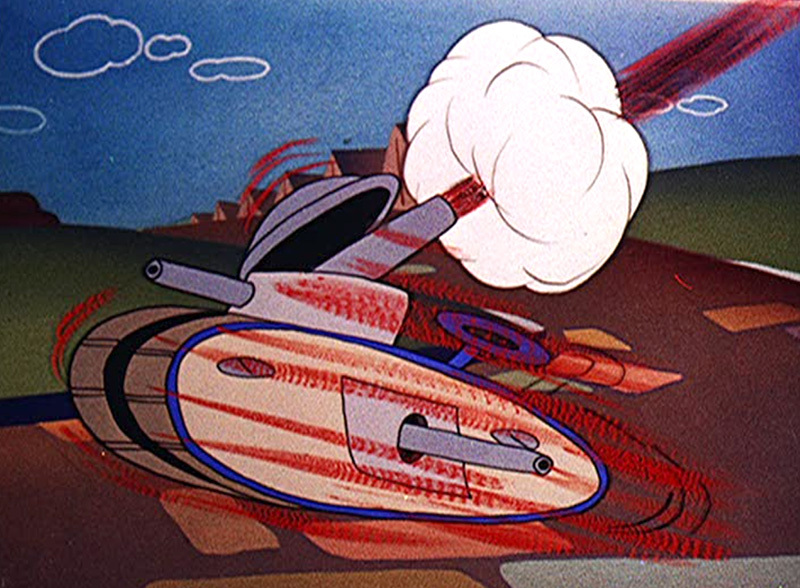 Daws Butler did Buzz Buzzard’s voice in the rarely seen Woody Woodpecker short Spook-a-Nanny.